What makes things worse is the stigma the name transfers to its owners. Geoffs are people who just seem uptight and kind of “off.” It’s as if they’re pod people from Invasion of the Body Snatchers, except instead of aliens, they’ve been taken over by WASPs from Connecticut. 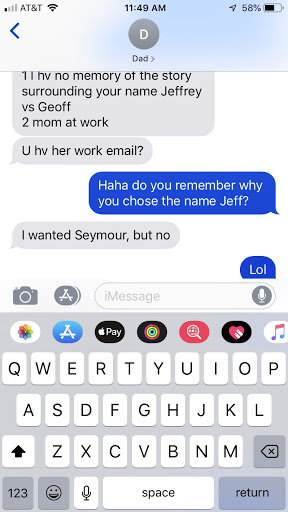 I say all of this, of course, with the complete understanding that my name is “Jeff,” Geoff’s kissing cousin and a name that isn’t much better. Even my dad can’t remember why he and my mom settled on it or what special meaning they had hoped it would bestow upon me. With that settled, I next put the question to my colleagues, asking them what they think about Geoffs. One called them “creepy.” Another described the name as “low-key rapey.” A bit strong, but I understand the sentiment. If your name is Jeff but it’s spelled Geoff than I hate you. To be fair, though, I’d yet to hear from the true subject-matter experts on the topic — actual guys named Geoff. How have they handled years and years of trolling by basically the entire world? “Hell no,” Geoff Thorne concurs. If nothing else, you’ve gotta respect their dedication.